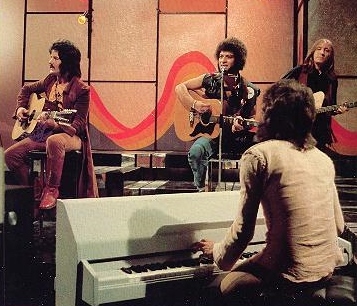 Lady Rose on TV – 1971. 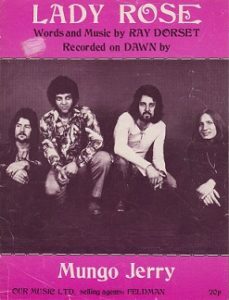 Lady Rose, the third maxi-single by Mungo Jerry in the summer of 1971, peaked at number five in the UK singles chart, and was destined to be the third consecutive chart-topper when it was effectively banned by the B.B.C for the inclusion of ‘drug track’, Have a Whiff On Me, on the disc. The time taken to re-press, and replace the ‘offending’ track with She Rowed from the Electronically Tested album cost it dearly and it duly missed out on the top spot. 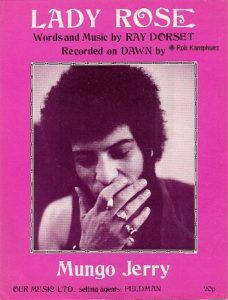 Over the years, Ray Dorset has become known as the songwriter and his alter-ego, Mungo Jerry the performer. Tracks: Lady Rose, Have a Whiff On Me (replaced by She Rowed/Milk Cow Blues, Little Louis. “I wrote this song on my twelve-string guitar very quickly on my return from the first U.S.A tour and demoed it in my maisonette and it definitely had some magic. “When we recorded it in the studio it was done pretty much the same except that Colin added his distinctive piano style to it and John played what I think was the perfect bass line for the track. I played all of the guitars, percussion and harmonica and of course did the vocals”. LADY ROSE (Dawn) – Having proved beyond any shadows of doubt they were no one hit wonders by returning a full 12 months after ‘Summertime’ to Baby Jump back to the top. Mungo Jerry are now in top gear and rolling fast! Which is slick jargon for saying they haven’t left it quite so long this time between singles. The main song is a jolly folksy thing with harmonica and piano – really quite a straight number but nevertheless very catchy. Little Louis is the other original by Paul King, and features one Stuart Cowell in place of Ray Dorset. The other two are Jerry re-vamps of – Have a Whiff On Me (or Have a Drink On Me as Lonnie Donegan had it) and the old Elvis favourite, Milk Cow Blues. This may not be as large a hit, but is as deserving”. After its sensational success with the jug-music style of In The Summertime, Mungo went to the other extreme with its follow-up, Baby Jump. So what happens next? Well, this latest track is something of a compromise between the last two. And if anything, reverts more to the skiffle-like style of ‘Summertime’ than the out-and-out rock of its successor. Strumming acoustic guitars provide an irresistable bounce beat, and there are electric 12 string guitar and bongos for good measure. The other titles are Have a Whiff On Me, Milk Cow Blues and Little Louis. Total running time is 16 1/2 minutes”. 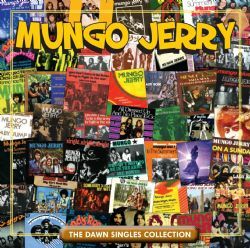 Lady Rose is included on a 2-CD set through CHERRY RED RECORDS, as part of the Dawn Singles Collection, and features all of the A & B-sides recorded by Mungo Jerry on the Dawn label from 1970 – 1974.